Electronic Arts (EA) on Thursday revealed the online features of its forthcoming Mac and PC game The Sims 3. The game will be released worldwide on June 2nd, and is coming to Mac, PC, the iPhone, iPod touch and mobil devices. The Sims 3 Game Launcher gives you access to the Web site, Sims Store and Exchange. The latest major installment of EA’s long-running “virtual life” game franchise, The Sims 3 puts you in charge of Sims, simulated people who go about their day-to-day lives while you help them make decisions about their career, loves, friendships, decorating, and where they’ll live. 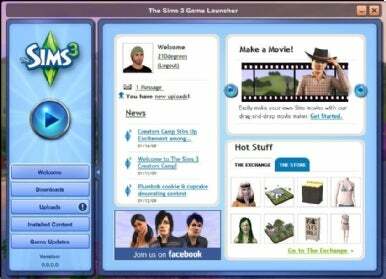 A Web site, TheSims3.com, will feature downloadable content. In addition to the “regular” town included with the game, players will be able to log on to the Web site download a second virtual town called Riverview. The site will also let players create and share their own movies showing their Sims in action and purchase additional content. The Sims 3 Store lets players buy and download exclusive in-game items, such as new outfits or furniture, appliances or other custom items you wouldn’t have access to otherwise. SimPoints redeemable at the store can be purchased using real money either using a credit card, PayPal or EA cash cards. A game launcher provides players a way to connect to the store and the “Exchange,” an online area where players can see what other players are recommending, what downloads are popular and what items are highlighted. Profile pages let players manage information about themselves and their in-game characters; a “My Studio” feature lets players manage movies, stories and Exchange objects; it also includes a blog space where players can post news, customize it with a personal avatar, track favorites and more. Users can also make friends with other Sims 3 players and share content with social networking Web sites. System requirements will call for an Intel-based Mac running Mac OS X 10.5.7 or later, 2GB RAM, ATI Radeon X1600, Nvidia 7300 GT or Intel GMA X3100 or better 3D graphics, 6.1GB hard disk space.